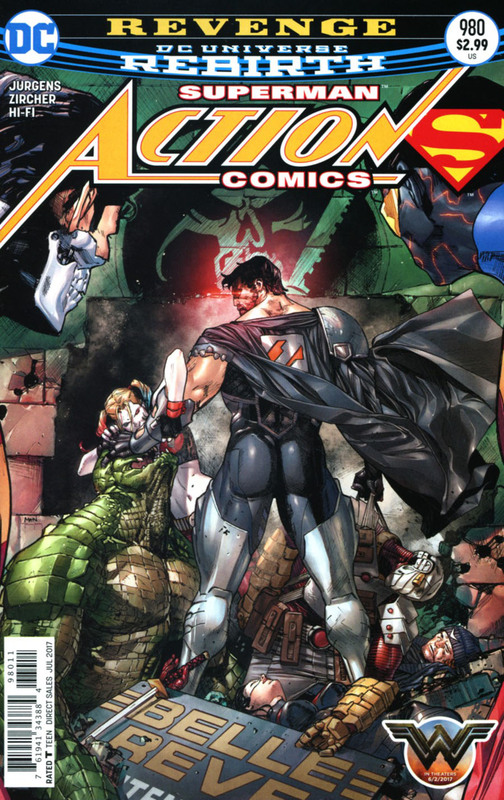 The Cyborg Superman lays out his plans for killing Superman and the motivations of Mongul, the Eradicator, Metallo and Blanque have for following him. Their next step; recruiting General Zod. Meanwhile Superman checks on Lois and Jonathan in Metropolis before heading to the Justice League's headquarters to use the equipment there to track his adversaries. He finds them at Belle Reeve Prison, headquarters to the Suicide Squad, and leaves to confront the Eradicator. At Belle Reeve the Eradicator and the Cyborg make their way through the Black Vault and the Cyborg relives the events that led to his current existence. Superman flies into the Black Vault as well and hallucinates that Jonathan and Martha are blaming him for their deaths. The Eradicator and Cyborg confront Superman and finally leave him trapped in the Vault with zombie-like versions of everyone he cares about telling him that everyone he lives will always end up dead. Story - 5: After an obligatory but, to be honest, necessary for new readers introduction to the Revenge Squad this issue hit the right beats to make this story more than just a "let's team up a bunch of villains to pound on Superman" affair. I actually liked the first few pages because, as I have been writing about since REBIRTH started, it's great to see these characters in this context again. Mongul had been coopted by the Green Lantern office for years and while that makes sense considering the events of THE REIGN OF THE SUPERMEN he got his start and then continued being an adversary for Superman. The Cyborg Superman's presence is welcome, which is odd to me because I'm the guy that thought that after SUPERMAN/DOOMSDAY HUNTER/PREY Hank Henshaw had diminishing returns as a villain. Time heals all wounds, I suppose. The fact that he was gone for so many years helps but like Mongul he got taken by the Green Lantern people for a time and now he is back as a for reals Superman villain. This reminds me how much of Superman's world was taken from him and given to other characters. I could go on about how unfair that was and how it was one of the factors that led to the almost decade's worth of bad decisions and bad stories but now is not the time or place for such a discussion. Bottom line; it's great to have these characters back in Superman's world. There was a lot of character work done in this issue and that continued to elevate this story from being a simple action piece. Jonathan's disappointment at having to move from the farm to the city is understandable and his arguments made perfect sense. Jurgens has had a great handle on the family dynamic of the Kents from the beginning of his run and that resonated in the conversation between Jon and Lois. The bit where Superman knows that Lois knows how much danger they are in was another reminder that a married with a kid Lois and Clark works when it is written by someone that is invested in the concept. The scene with Batman was also great. Their debate about the Suicide Squad was great and even though I sided with Superman I think that Jurgens didn't treat Batman as a straw man adversary. There's also something really cool about Superman taking a stand on an issue like this. He's not being a jerk about the situation nor is he saying that everyone should listen to him because he's Superman and that's that. He believes that Waller's Squad is a violation of the members' civil rights and no matter what good they do they are always doing it with a gun pointed at their head. On an extremely petty level is was great to see Superman tell Batman that he could handle the situation with The Eradicator. It wasn't done in a mean-spirited way and the cameo worked well for the story but given how many times Batman has appeared in a Superman story as the guy Superman went to for help it's nice to see the Man of Steel say, "I got this." Jurgens proved another myth about Superman to be false in the closing pages. Writers through the decades have said that Superman is hard to write because he's so powerful that coming up with a villain is difficult. This always misses the key strength to Superman as a character; it's not his powers that define him but his humanity. While it is exciting to see him throw down with Mongul or the Cyborg or Darkseid it's far more interesting to see him cope with his own emotions and feelings. As the movie said, all those things he can do and all those powers and he couldn't even save them. This is another reason why I'm not put out that in this new world Jonathan and Martha died years ago. I loved the stories where they were alive and they did provide an emotional support system that was vital to the Post Crisis Superman in his early years but on a dramatic level there is something to be said for having them on the other side of the veil. Again, if it's handled right it can lead to scenes like this where Superman is confronted by what he couldn't do, not what he can do. It was also an unexpected way to end the issue. We nearly had a confrontation between Superman and the Cyborg and Eradicator but that was cut short by the Black Vault. It was a great cliffhanger to leave on and teased out the ultimate confrontation to come. Jurgens is pacing this story just right and I look forward to the next chapter. Art - 5: Zircher continues to deliver exciting and engaging art. The zombie-like images of Superman friends and family at the end of the issue were creepy and he, along with the writing, made the expositional scenes not feel like your typical expositional scenes. I also continue to like how he draws Superman in flight. That's something that can get boring quick but the way Zircher composes those scenes are anything but. Cover Art - 4: The cover is fine but I'm slightly put off that none of this happened in the book. 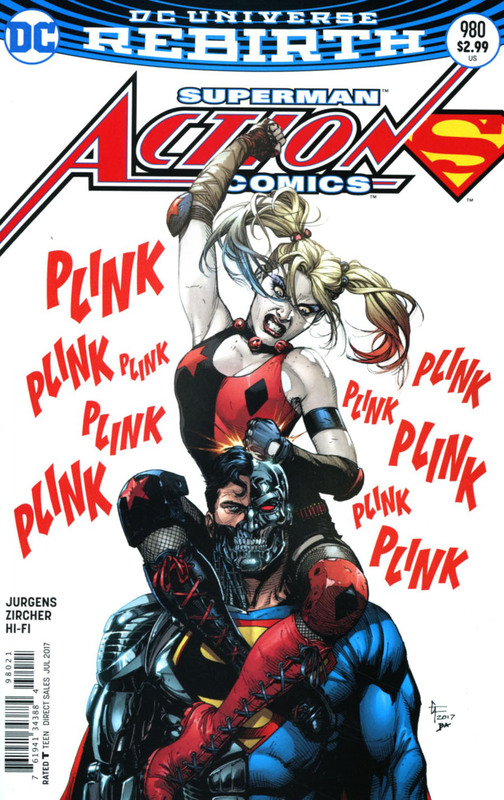 It's not that the comic was a disappointment but having Zod and Harley on the cover indicates that they'll be in the story as well. It's slightly pedantic but if this is the only thing I complain about then I think the cover is still very well done. Variant Cover Art - 5: That image is hysterical. A very good use of Harley on a variant cover. The Cyborg's normal emotionless face sells the gag beautifully.